Few topics have polarized locals in the Langhe as the recent construction of Il Boscareto, a new luxury hotel in Serralunga. This ambitious project was vociferously protested by many, who dubbed the huge building an “eco-disaster.” Take it from someone who has visited Piedmont regularly for over a dozen years, the region has long needed a full-service, high-end hotel near the vineyards of Barolo and Barbaresco, of which there is now exactly one. That said, it is impossible to ignore Il Boscareto’s massive visual impact on these bucolic hills. The hotel’s exterior appearance is indeed atrocious and totally out of scale, something that is surprising given the Italian penchant for design. Things are better in La Rei, the hotel’s restaurant, which is beautiful in design and conception. Chef Giampiero Vivalda, owner of the celebrated Da Renzo oversees the kitchen. This was my first dinner at La Rei, and it was sublime. We opted for fairly simple, straightforward dishes, as the focus was on the wines. Still, making a perfect plate of tagliolini is much more difficult than it appears – trust me, I had some horrendous versions on this trip – and the kitchen excelled in everything from the simplest to the most complex of preparations. The braised veal cheek with San Remo shrimp was a playful combination that worked beautifully. The aforementioned tagliolini were utterly divine, and the roasted veal was cooked and seasoned to perfection. 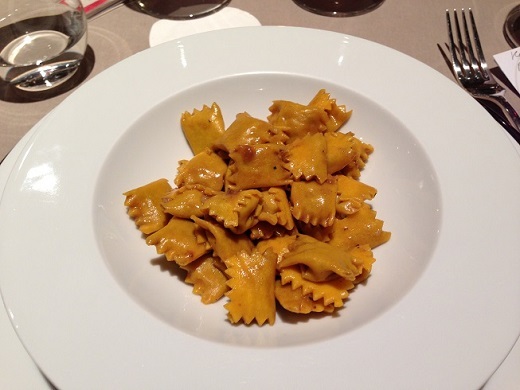 The Agnolotti al Plin were rich, salty and not as delicate as they can be. Wine service was very professional, and of a level I have rarely encountered in Piedmont. This tasting of 1989 and 1990 Barolos and Barbarescos is one I will not forget anytime soon, perhaps ever. All of the bottles were breathtakingly beautiful as they came directly from the producers’ cellars. From the moment the first wine was poured everyone at the table looked at each other recognizing the uniqueness of the moment. Even though the first wines were brilliant, things kept getting better with each subsequent flight. Giuseppe Rinaldi’s are among the rarest Barolos made. Because Rinaldi has long sold to large list of private consumers, the wines tend to disappear into the cellars of seasoned collectors and hardly ever appear on the secondary market in large quantities. The 1989 Barolo Riserva Brunate is insanely beautiful. Sweet, balsamic aromatics literally jump out from the glass, then meld seamlessly into an expressive, layered core of fruit. Delicate and powerful at once, the wine reveals superb balance and a long, fresh finish. The 1990 Barolo Riserva Brunate is very much a mirror image of the vintage; fat, rich and opulent, with gorgeous inner perfume and superb balance. It is awfully hard to pick a favorite here, as both wines are drop-dead gorgeous. Wow. Bartolo Mascarello’s 1989 Barolo (magnum) reveals incredible richness and density in a fresh, layered style. Plums, prunes and sweet spices are some of the nuances that emerge from this awesome, mythical Barolo. The 1990 Barolo (magnum) is fat, rich and fuller-bodied, with exceptional richness and length. Stylistically the wines are a touch understated relative to the decidedly muscular wines from Rinaldi but they are both utterly captivating. I have had the privilege to drink – not just taste – Giuseppe Mascarello’s 1989 and 1990 Barolo Monprivato on several occasions this year, but that notwithstanding I am frankly not prepared for the sensational showing of these bottles. The 1989 Barolo Monprivato is staggering in its freshly cut roses, spices and hard candy. The wine possesses a level of inner sweetness and kaleidoscopic, multi-dimensional aromatics that sends everyone at the table into near-ecstasy. Still vibrant and fresh, the wine has enough richness to last another ten years. The 1990 Barolo Monprivato is every bit as exceptional. Rich, sweet and intense, the wine flows onto the palate with an opulent, caressing core of perfumed fruit. The 1990 is slightly more forward than the 1989, but for this typically long-lived wine that isn’t such a bad thing. Roagna’s wines are exceptional on this night. The biggest surprise is the 1989 Barbaresco (magnum), which is truly impressive. The wine reveals a core of perfumed fruit that might easily be mistaken for Burgundy. I am sure the magnum format has helped preserve a measure of freshness. Still, considering this is the entry-level Barbaresco in 1989, the wine frankly has no business being this outstanding. The 1990 Barbaresco is fully mature in its sweet, spiced fruit and round, caressing personality. Considering its nearly 20 years of age, I can’t ask for anything more for an entry-level Barbaresco in this vintage. The 1990 Crichët Pajé makes an eloquent case for being the Monfortino of Barbaresco. This explosive wine bursts onto the palate with a complex array of licorice, tobacco, grilled herbs, tar, dried roses and smoke. Still massive and powerful, the wine has another two decades ahead of it. These wines from Giacomo Conterno, the 1990s is particular, are breathtaking. Sadly, in 1989 Mother Nature was not kind to Conterno, as hail wreaked havoc on the vineyards. There was no Monfortino that year, and Conterno released just 4,000 bottles of the 1989 Barolo Cascina Francia. Leather, spices, tobacco and licorice are some of the nuances that emerge from this austere, powerful Barolo. In this context, next to a set of profound 1989s and Conterno’s own 1990s, the wine suffers a bit, but it is still magical juice. Conterno’s 1990s are off the charts. The 1990 Barolo Cascina Francia possesses gorgeous richness and transparency, while the weight of Serralunga comes through in spades. Seductive and powerful, this magical Barolo is utterly spellbinding. The 1990 Barolo Riserva Monfortino is almost too much at this point. While the 1990 Cascina Francia delivers tons of pleasure, the 1990 Monfortino is still years away from offering its finest drinking. Still, this breathtaking Barolo is a pleasure to drink for its round fruit and long, powerful finish. It is exceptional in every way. Gaja’s 1958 Barbaresco Infernot is one of Piedmont’s most iconic and rare wines. I am deeply indebted to my dear friend Rino Fontana for giving me an opportunity to taste this Barbaresco from a perfect bottle. Still wonderfully intact and pure, the wine reveals a rich, hedonistic expression of dark fruit, tobacco, sweet spices and herbs, showing surprising richness for a wine of its age. Then again, we’re talking about 1958, one of Piedmont’s most important vintages. Even 50 + years ago, Gaja was making great wines. This bottle was truly unforgettable, and a fitting conclusion to one of the greatest tastings/dinners I have ever been a part of.